The key takeaway from the residential sections of the draft zoning ordinance: the intent to keep things as built, except where it doesn’t. The city planners and consultants who developed the plan were given a brief: have the zoning map reflect the built status quo. None of the city’s residential neighborhoods will be upzoned — rezoned for more intensive use — as a result of the new zoning. There aren’t wholesale changes, for instance, that allow multi-family homes where there are none currently. But, there are some meaningful changes that reflect a response to certain trends, like the proliferation of McMansions and snout houses. As discussed in my first post, the draft zoning ordinance has two aspects to it: the how (or mechanisms) and the what (or standards). That first post addressed key aspects of the how. This post will describe a bit of the what: how the new zoning trues up the rules to match what’s actually built, as opposed to what is supposedly allowed or not allowed. At a very simple level, the current zoning allows only single-family residences in some districts and allows multi-family residences in other districts. As is frequently noted, more than 85% of the lots in the city are non-conforming, meaning that what is built on the lot is not allowed by the zoning that applies to the lot. A good portion of the non-conformity is attributable to multi-family homes that have been built in single-family districts. The current zoning has three single-family zones: SR1, SR2, and SR3. The differences among the three zones relate to intensity of development, all of which is calculated. The zoning (mostly) doesn’t tell you what kind of house you can build, just how big it can be, mostly based on lot size. SR1 requires a larger lot size than SR2, which requires a lot size larger than SR3. SR1 allows less intense development — as measured by floor-area ratio or FAR — than SR2 or SR3. Smaller lots in all three zones have a higher allowable FAR than larger lots. There are similar dimensional controls in the four multi-residential zones: MR1, MR2, MR3, and MR4. The proposed zoning has four residential district types (and a quasi-district). The official districts are R1, R2, R3, and Neighborhood General. The quasi-district is Non-Contextual Multi-Unit Residence, about which more later. Instead of calculated dimensional controls as with the current zoning, the proposed zoning ordinance has a menu of allowed building types across the four residential districts. Lot size is a relatively minor factor. For present purposes R1 and R2 districts are limited to single-family housing, analogous to SR1, SR2, and SR3.1 R3 and Neighborhood General allow single- and multi-family housing. If you look at the current zoning map, you will find lots of examples of non-conforming multi-family housing. Take Cypress St., for instance. The entire street falls within an SR3 zone, which does not allow multi-family housing. Yet, there is a run of multi-family homes, and they are not of a type that fall within an SR3 exception. The proposed zoning map assigns neighborhoods to zoning districts based on what’s already built. According to Deputy Planning Director James Freas, the intention was to create districts that best reflect the housing that exists, with every effort made to put all lots on the one side of the street on a block in the same district. At the level of single- v. multi-family, if a neighborhood has existing multi-family housing, it will be R3 or Neighborhood General. If not, it will be R1 or R2. The distinctions between R3 and Neighborhood General and between R1 and R2 have to do with proximity to village centers, lot size, and house types, which I’ll discuss in a later post. Consistent with the mandate not to upzone, the same-street, same-district rule is broken on some streets that have a mix of single- and multi-family housing. 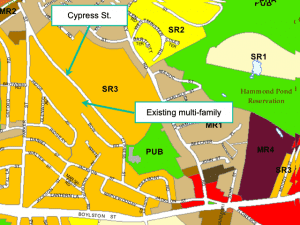 On Cypress St., the lots with single-family homes are R2 and the lots with multi-family homes are R3. If there are any lots with single-family homes that are proposed for R3 or General Neighborhood are mixed in among multi-family homes and are likely already zoned MRn. The city has prepared a a static comparison map that compares the proposed zoning districts (in color) to the current zoning districts (text). 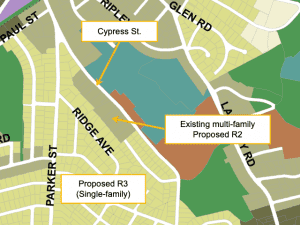 Here is the situation on Cypress St. Take a look at your neighborhood and see if there are single-family homes that are proposed to be in an R3 or Neighborhood General district that are not already in an MRn district. If you find any examples for which this is not true, please let me know in the comments. With that understanding, you can see that the proposed zoning map maintains current single-family neighborhoods as single-family and only allows multi-family zoning in neighborhoods where it already exists, limiting multi-family even at the lot level, not the block level. The map is consistent with a value-less attempt to simply bring the zoning map into conformance with the built reality. At least in terms of single- v. multi-family housing, the map maintains the status quo. The message to those of use who are in favor of upzoning and other value-based change is that the city first needs to change the mechanics of zoning and true the map, then we can turn our attention to changing what’s allowed. Turns out, though, the proposed zoning has a bunch of value changes. And, the purpose sections for each of the residential districts express a strong bias towards preserving the status quo. In future posts, I’ll discuss these and the notion that now is not the time to be making significant changes to our city’s zoning. 1 Both the current and proposed zoning have narrow exceptions for multi-family housing, mostly having to do with the conversion of larger homes to multiple units. The 500 foot distance measure will increase density where it is already dense, and leave the other districts as is. This is not equitable, it puts too much of a strain on already dense areas. I think that the intention of the proposed zoning was not to create new opportunities for multi-family housing, but to reflect existing opportunities (already zoned MRn) and to reflect already built non-conforming multi-family (multi-family homes in SRn zones). Are you aware of lots that are currently zoned for single-family that actually have single-family homes, but will be re-zoned as multi-family? If so, I’m happy to write a follow-up post. My zoning went from M1 current to R3. 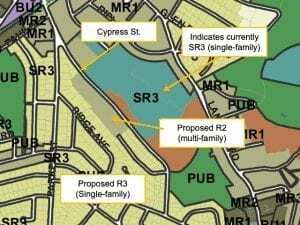 Me: If I bought a 2 family house in R3, could I reconfigure it to a single family? Can I build a new single family house? House B and House C are both single-family dwellings. There is nothing in the rules — that I see — that prevents you from down-sizing from multi- to single-family. I’ll follow up with James to see what he might have meant. Sean — Amost all of Warwick Road has been zoned R3, from SR3. That street is currently a mix of two-family and single family residences. That’s kinda my point. The multi family homes are going to become more numerous in the areas where they already exist. Therefore those areas will become more and more dense while places already less dense will stay that way ( or are more likely too). It’s not a fair sharing of the so called affordable housing problem or whatever problem the city is trying to solve. If people want more density, let it happen everywhere not only just in my neighborhood. Or, be ready to face the accusations of NIMBYism , literally. I sat across the table in the planning department with James,Rachel Nadkarni and Susan Albright. I’m pretty sure I heard them correctly. The area north of Watertown St (Rte. 16), between Albemarle and West Newton, was all SR3, and now has quite a lot of R3 zoning. I don’t know how many of those lots currently have single family homes, but I know that there are plenty — look at Warwick Rd, Kilburn Rd, Colman St, for some examples. On my street, Brookside, there are I believe ( just counting in my head ) 11 single families and 4 multi. I live in a single family. There’s a mouse in the basement but I’m not counting him. While it sounds good ; “keeping thing as they are built” the result will be A disproportionate burden on the already dense areas as more apartments and multi families get built while the R1 and R2 areas remain less dense given the 500 foot rule. It will also create a further class divide for those same reasons. And there’s no going “backwards”. What I will do is write a software simulation of what will happen. It’s pretty easy for me, since I do this sort of thing for a living, basically I can do a random distribution of houses with weights to simulate existing R1,R2 and R3 zones. These would be clustered with even spacing within clusters. Then using the 500 ft radius rule ( using a circular distance ), doing a brute force search, convert all the single family home to two family homes. 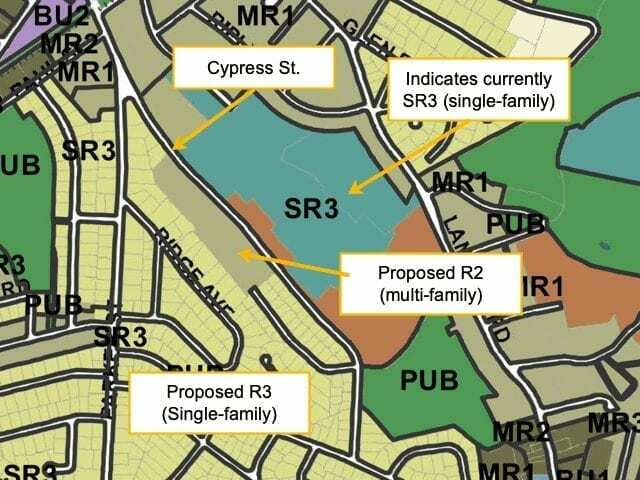 My hypothesis is that you will see the R3 areas become exclusively multi family and the other zones taking a much longer time to transition, if at all. The simulation can run over an$ over again with differen5 random inputs. Sometimes nothing will happen, but over the majority of times I predict it will change dramatically. @Rick Frank. I look forward to seeing what you come up with. @Rick Frank – No need to write a simulation, you’ve already told us that you will build in an unproven assumption into your model so that the results will be guaranteed to give the result you want. This reminds me of the “model” floated during the accessory apartment debate that predicted that every home that could legally build an accessory apartment would do so and the number of units of housing in Newton would skyrocket. No mention in your simulation of any housing going in the opposite direction (more to fewer units). We’ve had a few of those in my neighborhood in recent years. As I mentioned, I have it from James Freas that I could not buy a multi family home in R3 and covert it to a single family home. So, you’re correct that my silumation would not include that, because, I have it directly from the planning department that I could not do that unde4 the current zoning. And, the circular distance metric of 3 within 500 feet is their proposal. At least I’m willing to write a simulation. That’s more than they would do. The mayor in chestnut hill and those in S1 are the NIMBY hypocrites, they want the city more dense, but not in their neighborhood of course. We have the lovely mass pike, the wonderful new developments that will give us 2000 new units on Washington Street and gee they aren’t being shared by the whole community…let’s spread the love around more equally. Sorry for the typos I’m on my phone. @jerry and, I would add that if it’s not a big concern, why not allow multi family development in all residential zones? Why not? Thanks for the examples. I think you have hit the nail on the head with the consequence of the city trying to both reflect the current built environment and not have lot-by-lot zoning. If you make multi-family zones where any multi-family exists and restrict neighborhoods with no multi-family to single-family, new multi-family will go into the neighborhoods where it already exists. I’ll review the streets you’ve identified and post something. My intention with this post and the next few posts is to explain what’s going on, not critique it. But, it will not be a surprise to regular readers that I wholeheartedly agree with you (on at least one dimension): the right to build multi-family housing has to be spread across the city. It can’t be limited to adding density to the already (relatively more) dense sections. Also, Rick, I think an accessory apartment is probably the best bet for the mouse.